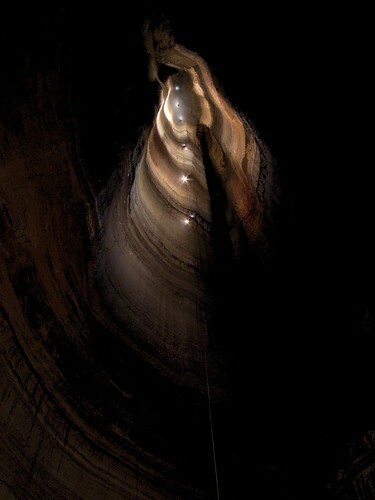 Fantastic Pit is 586' deep, which is the deepest known cave pit in the continental United States. Special thanks to Dave Riggs, Judi Wasilewski and Mary Schmidt for all of their help with this photo. This photo wouldn't have been possible without their help holding flashes, hauling gear and their patience on this cave trip. Also, thanks to Tom Hay for supplying me with flash bulbs and some photography advice. Note: This is a very technical cave and serious training is required to safely access it. Contact a local grotto with the National Speleological Society (www.caves.org) for more information about caving in the US.